The Three Rings refer to the Elven Rings of Power – Vilya, the Ring of Airs; Nenya, the Ring of Waters; and Narya, the Ring of Fire. 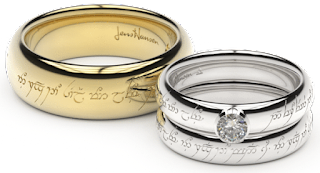 These Rings were crafted during the Second Age by Celebrimor of the Noldor and the Elvensmiths of Eregion. They were wrought without Sauron’s assistance – they were made for the purpose of understanding and healing – and as such, they were not tainted or sullied by his hand. However, they were not immune to the control of the One Ring, which would reveal the wielder of each Ring to Sauron if he possessed the One Ring. Throughout the Second Age, the Three were successfully hidden from the Enemy; in the Third Age, they were used in secret. But upon the destruction of the One Ring, the power of the Three failed, and all things wrought with them failed. They were taken (with their Keepers) to the West at the end of the Third Age. Vilya, the Ring of Airs (also known as the Blue Ring), was the mightiest of all. It was originally possessed by Gil-galad, who passed it on to Elrond at the end of the Second Age. 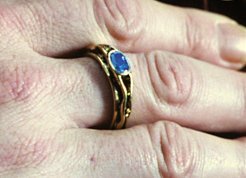 It was a golden ring set with a blue sapphire. 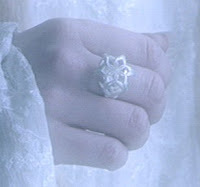 Nenya, the Ring of Waters, was always kept by Galadriel. Its stone was a white of great beauty; as such, it was sometimes referred to as the Ring of Adamant. 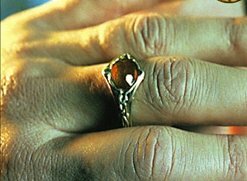 Narya, the Ring of Fire, was borne by Círdan the Shipwright until the end of the first millennium of the Third Age, when it was then surrendered to Gandalf, who wore it for the remainder of the Age in pursuit of his task of uniting the Free Peoples against Sauron, the Lord of the Rings. Narya was set with a ruby. My favorite is Nenya! It has both *bling* and grace. Truly collectible. Love your blog - followed from Twitter! I like Narya better, though it had a vague history of its creator. By the way, who created the three ring? was it created during the 1st age when Gladriel and Celeborn first arive? I love your blog. I may say that i'm a HUGE FAN of Lord of the Rings. I'm like obsess. The three rings were created in the Second Age by Celebrimbor, lord of Eregion, son of Curufin, and grandson of Feanor. Said to be second only to his grandfather in skill of craft, and in a bid to undo the evil worked by the Oath and to win back honor for the house of Feanor, of which he was the last remaining, he set out to make the rings of power. Sauron, disguising himself in fair form as Anatar, an emissary from the Valar, came to Celebrimbor offering him assistance in the task. Celebrimbor trusted him against the advice of Galadriel and Gil-galad, and let him aid in making the seven dwarf rings and nine rings of men; however, he made the Three Rings in secret without Anatar's help. Meanwhile, Anatar secretly created the One Ring in Mordor to control all the other rings. But his plan was perceived by Celebrimbor, who immediately hid all the rings; seeing he was discovered, Sauron took the forces he had secretly amassed for himself in Mordor and attacked Eregion, capturing Celebrimbor. He tortured him to try to find the whereabouts of all the rings, but Celebrimbor told him only of the Seven and Nine. Sauron used Celebrimbor's body as a standard in an ensuing battle with the elves and captured the Seven and the Nine for himself. Wow, this is long. XD Took longer than I thought it would, lol. Some of this is explained in Appendix B of Return of the King; the more detailed info is originally from the Unfinished Tales and Histories of Middle Earth series, though I got it through sundry articles about Celebrimbor on the internet. :P Anyway, hope that wasn't confusing!